Football Blueprint is an easy-to-use mobile app that will simplify your coaching job, eliminate stress, and help you achieve more success on the field. Inside, you’ll discover more than 140 championship proven drills and plays, along with innovative tools to plan your practices and create your own custom playbook. Visit our features page for more details. Just press the App Store or Google Play button below and you'll be directed to our app download page. From there, just press GET or INSTALL and follow the instructions to install the app on your mobile device. 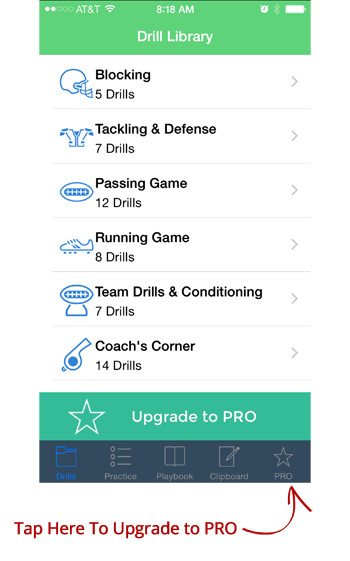 Football Blueprint is designed for use on iPhone or iPad. An Android version is in the works! Yes! The free version of Football Blueprint gives you instant access to more than 30 championship proven drills and plays. Additional drill packs, playbooks, and coaching tools can be unlocked for a small fee. Upgrading to PRO unlocks the Clipboard (so you can draw your own playbooks), the complete Practice Planner, the complete Drill Library and all the Playbooks. To upgrade, tap the PRO button in the bottom right corner of the app. Follow the prompts to complete your upgrade and access the unlocked content. Yes! Any in-app purchase you make can be downloaded to multiple devices. 4. You should see a link that says "Restore Purchase." Tap this link to download your in-app purchase content to the second device. All the files are in streaming video format, and require an Internet connection to play. The app works best when your device is connected to a Wifi network. If there is no volume on your video playback, it's probably because your device is in silent mode. To fix this, look for a small button on the side of your device and flip it from "silent" to "ring".